Disclaimer: This article does not provide guidance or intend to compare technical features of different IoT platforms. It looks at the market and compares platforms purely on a market meta level. Although some firms claim billion-dollar revenue streams through IoT, our IoT Platform Comparison continues to show that these claims are mostly pure marketing. In the last year, we followed-up at least two such claims with larger vendors and found that they claimed new “IoT” revenue that had actually been relabelled from previously existing revenue. Furthermore, the sales figures included expensive hardware equipment and only very little software revenue. 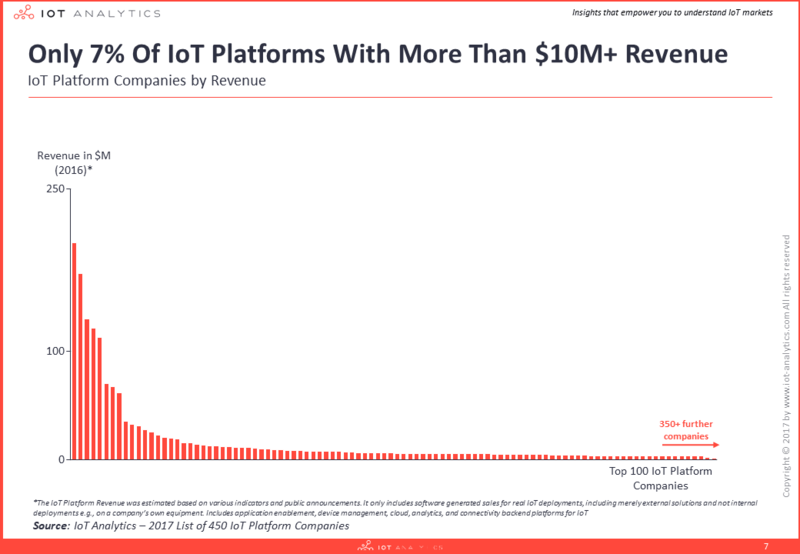 “Half of all IoT Platform companies made less than $1M in 2016”We believe, only 7% of the 450 IoT Platform companies generated revenues in excess of $10M with their IoT Platforms in 2016. Furthermore, more than half of all companies made less than $1M, most of them smaller startups. The firms leading the pack are mainly made up of large cloud players, legacy device management and connectivity backend platforms as well as a handful of heavily backed Silicon Valley startups that are scaling faster than most of their counterparts around the world. Successful startup examples include predictive analytics firm Uptake and the open Smart Home Platform SmartThings, acquired by Samsung in 2014 and now acting as their subsidiary. Note: The IoT Platform Revenue was estimated based on various indicators and public announcements. It only includes software generated sales for real IoT deployments, including merely external solutions and not internal deployments e.g., on a company’s own equipment. C3 IoT, valued at $1.4BN in March 2017, recently announced a revenue increase of 65% year-over-year and bookings that have grown by 600%. The company also claims to have 100M Sensors and devices under management – so far, the highest number publicly announced. Cisco Jasper’s connectivity management platform “Control Center” has grown from 3,500 user companies in March 2016 to more than 9,000 in February 2017, thereby increasing the number of managed connected devices from 17M to 40M. PTC increased its IoT revenue by 52% in 2016. Its core IoT offering is the application enablement Platform Thingworx, which it acquired in 2014. One note of caution: In our mind, these growth numbers are a reflection of the large amount of pilot projects and POCs happening in the market but do not (yet) indicate the long-awaited IoT breakthrough that would lift this market into the billions. There are generally more IoT Platform Companies focussing on Business/Enterprise IoT than Consumer IoT. The most popular segment for IoT Platforms lies in manufacturing and industrial solutions. 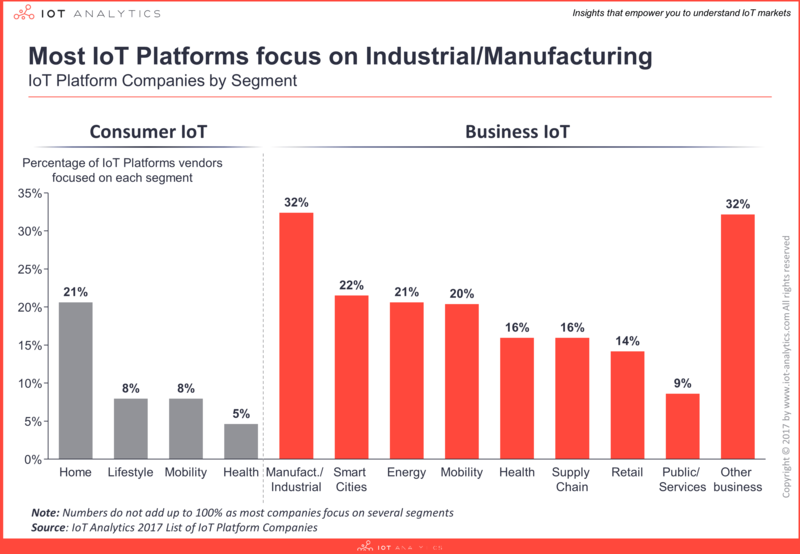 32% of the IoT Platform Companies offer solutions for this market including industrial automation firms like Siemens, ABB, Schneider or Bosch but also software vendors like IBM, PTC or Microsoft. Typical supported use cases include production performance management, manufacturing analytics, predictive maintenance and remote service. The IoT Platform Comparison reveals that the other large segments are Smart Cities (22%), Smart Home (21%) and Energy (21%). Customer Health is the least popular segment for IoT Platforms, with only 5% of all IoT Platforms offering solutions. These results concur with our analysis of the top IoT application areas, in which the 4 leading segments were Connected Industry, Smart City, Smart Energy and Connected Car. According to our analysis, the number of new IoT Platform startups reached its peak in 2013, with numbers going down ever since. Startups coming to market in 2016 have a different focus than those that started in 2013 or earlier: Back then many of the startups had a horizontal, cross-industry approach to IoT while nowadays there seems to be a higher numbers of niche IoT Platforms that are specialized by vertical, technology or use case. Examples are: Axonize, an IoT platform for System Integrators or Tachyus, an IoT Platform for the Oil & Gas Industry. 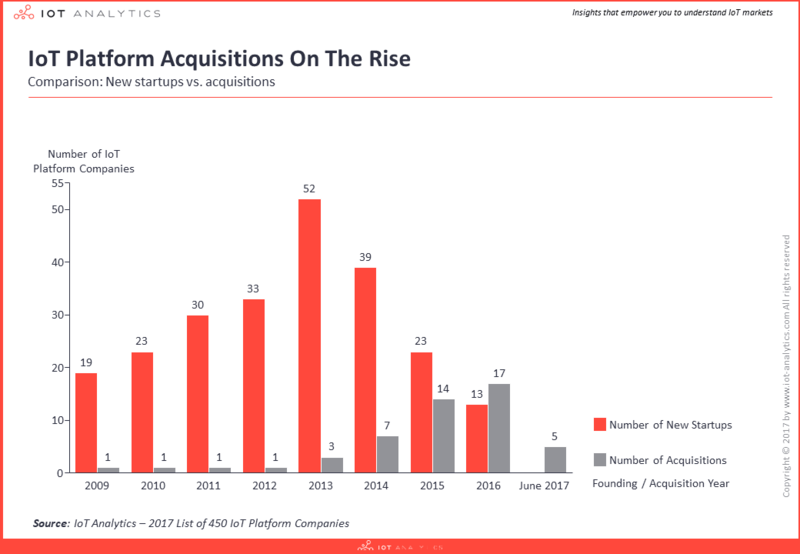 Meanwhile the number of acquisitions in the IoT Platform market is on the rise. 2016 was the first year in which the number of newly acquired companies (17) rose higher than the number of startups we identified (13)*. The deal value of the 6 acquisitions that disclosed the purchasing price lies around $11B. Most of the acquisitions are performed by tech firms that play in the vicinity of IoT but lack IoT platform capabilities. The acquisition of Cumulocity by Software AG earlier in 2017 is a good example for an analytics and enterprise software focused company completing their offering by acquiring a pure-play IoT Platform vendor. 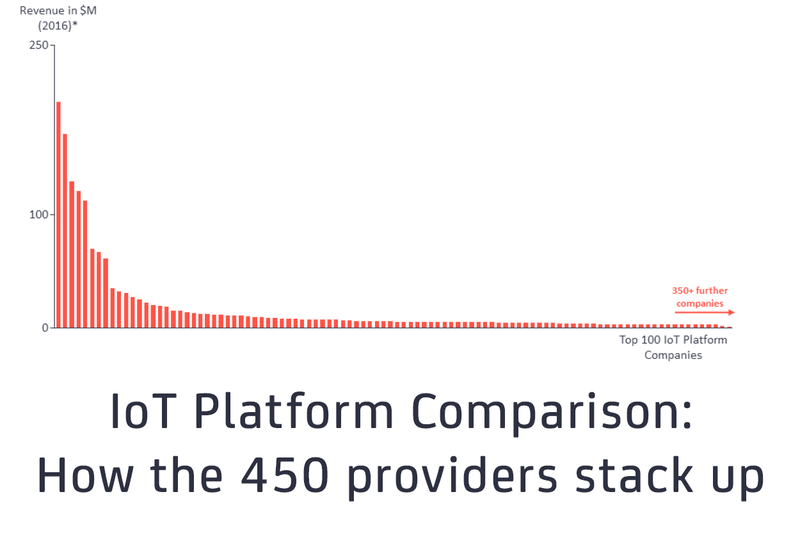 Our IoT Platform Comparison shows that there are a total of 31 IoT Platform companies, which have been acquired and whose platform is still available today, operating under the original name. Furthermore, there are 21 companies whose platform is no longer available after having been acquired. All acquisitions can be found in a separate tab in our 2017 IoT Platforms Database. 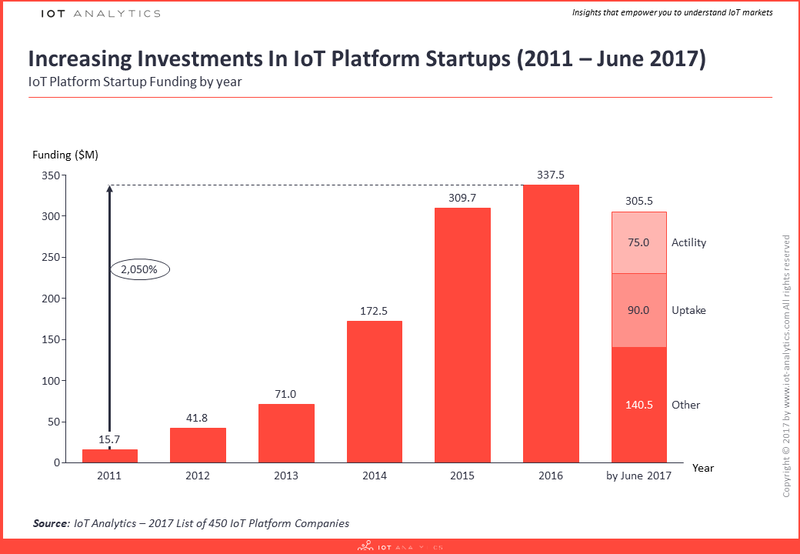 Funding for IoT Platform startups has risen sharply between 2011 and 2016. “IoT Platform funding is insignificant. Ride sharing platform Uber received 14x more funding in 2016 than all IoT Platforms combined”However, IoT Platform funding is insignificant compared to mature tech topics. Just consider that in 2016, ride sharing platform Uber received 14x more funding than all IoT platforms combined in the same year ($4.9B vs. $338M). Half of the IoT Platform funding issued in 2017 so far went to two companies (Actility and Uptake). Neither of them are pure-play IoT Platform firms. Actility, a LPWA solution provider that runs the Thingpark platform which caters mostly to Lora deployments, received funding of $50M in April 2017. Cisco investments is one of the named investors. Uptake, an analytics platform which was founded in 2014, achieved the impressive funding round of $90M in Series B. Notable investors in the IoT Platform space besides Cisco Investments (e.g., invested in Actility, Ayla Networks, EVRYTHNG, Relayr, Sensity Systems) include Intel Capital, GE Ventures, New Enterprise Associates (NEA) and Kleiner Perkins Caufield & Byers (KPCB). All information presented in this IoT Platform Comparison is based on our research in the IoT Platforms space. Our most recent product, the IoT Platform Company List 2017 is a structured repository of 450+ companies that are offering Internet of Things platforms. The IoT Platform Companies List 2017 helps executives gain an understanding of the different Internet of Things platforms across various geographies and industry verticals. You can find the IoT Platform Company List 2017 here and request a free sample here. Zaña Diaz Williams is a senior research analyst focusing specifically on the future of industrial technology: Industrie 4.0, industrial internet, IIoT. Her background is in production technology and management. I’m just wondering if WISeKey is mentioned in your report. We do not provide “IoT platform” but “IoT security framework” to be integratd into those ioT platforms. I’m curious about future of the IoT platform market structure. A few player would take the dominant position with integrated system like the Microsoft in office application, or players would be layered into the product supplier and the system integrator like Dell/HP and Accenture? I prefer the latter case and I hope the open standard of the IoT platform for the each industry would be established where many kinds of players could provide product and survice. Hello Author, Very interesting report. I don’t see AT&T IoT platform in your reporting and website. Actually the platform deserves the place in top 25. How do I help IoT Analytics to understand full value prop to get the information on the comparison chart?